Mix two-part epoxy glue as instructed on package. Using a toothpick place two small dots of mixed glue near center of pendant art. 6902 jet from the Swarovski crystal assortment (see picture for correct way to lay pendant). Apply a small amount of beeswax to the end of a clean toothpick. Pick up one flat back no hotfix art. 2058 light Siam using the tip of the beeswax toothpick and place on one of the glue dots. Repeat with second flat back no hotfix art. 2058 light Siam. Allow glue to dry for recommended time on glue package. Clean any glue residue with a Q-tip dipped in acetone. Open five round jumprings and two oval jumprings. Attach one round jumpring to bat and close. Attach two round jumprings to Swarovski fancy stone art. 4139 jet and close. Repeat for second fancy stone and set aside. Using the oval jumpring, attach to round jumpring on bat and one round jumpring on Swarovski fancy stone. Close jumpring. Using second oval jumpring attach the two fancy stones together by connecting the round jumprings. Set this pendant aside. Repeat Step 2 using four beads art. 5328 5mm hyacinth. Repeat Step 3 using three beads art. 5328 5mm hyacinth. Repeat Step 4 using two beads art. 5328 5mm white alabaster. Repeat Step 5 using one bead art. 5328 5mm white alabaster. Take both tails of the remaining wire and working the wire together, create a wire wrapped loop. Open six round jumprings and three oval jumprings. Attach two round jumprings to fancy stone art. 4129 jet and close. Repeat for other two fancy stones and set aside. Using the oval jumpring attach the corn to one round jumpring on a fancy stone and close. Using second oval jumpring attach the two fancy stones together by connecting to the round jumprings. Repeat for third fancy stone and set this pendant aside. Using two pieces of wire from Step 1, slide on one sew-on stone art. 3700 10mm jet, one fancy stone art. 4139 14mm jet, one sew-on stone art. 3700 10mm sun and one bead art. 5540 12mm jet. Keep the two wires apart; on one wire slide on one bead art. 5328 4mm jet. On the second wire, slide three beads art. 5328 3mm jet and two beads art. 5328 2.5mm jet. Cut the wire 10mm from the last bead art. 5328 2.5mm jet. Using round-nose pliers, turn a loop towards the bead art. 2.5mm jet--at least 1.5 - 2 rotations. Using the second wire that has the bead art. 5328 4mm jet on it; turn a loop and then wrap the wire around the bead art. 5328 4mm jet and create a wire wrap between the bead 5328 4mm jet and the bead art. 5540 12mm jet. Trim tail and tuck next to coil made. OPTIONAL: Using a 3-inch piece of wire, wire wrap bead art. 5714 8mm jet and attach to the coiled loop made at the end of the bead art. 5328 2.5mm jet. Open four round jumprings and one oval jumpring. Attach one round jumpring to the loop on the witches hat and the fancy stone and close. Attach another round jumpring to the fancy stone and close. Attach two round jumprings to second fancy stone art. 4139 14mm jet and close. Using an oval jumpring attach the two fancy stones together by connecting the round jumprings. Set this pendant aside. Using beading wire string on forty Swarovski Xilion beads art. 5328 4mm jet, one bead art. 5328 4mm white alabaster, one bead art. 5328 4mm hyacinth, one bead art. 5328 4mm sunflower, one bead art. 5328 4mm jet. Add bat pendant drop. Add one Xilion bead art. 5328 4mm jet, one bead art. 5328 4mm sunflower, one bead art. 5328 4mm hyacinth, one bead art. 5328 4mm white alabaster, two beads art. 5328 4mm jet, one bead art. 5328 4mm white alabaster, one bead art. 5328 hyacinth, one bead art. 5328 4mm sunflower and one bead art. 5328 4mm jet. 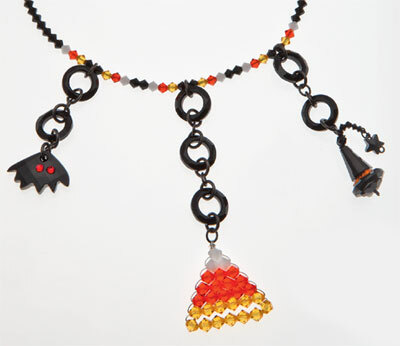 Add candy corn pendant drop. Add one Xilion bead art. 5328 4mm jet, one bead art. 5328 4mm sunflower, one bead art. 5328 4mm hyacinth, one bead art. 5328 4mm white alabaster, two beads art. 5328 4mm jet, one bead art. 5328 4mm white alabaster, one bead art. 5328 4mm hyacinth, one bead art. 5328 4mm sunflower and one bead art. 5328 4mm jet. Add witches hat pendant drop. Add one bead art. 5328 4mm jet, one bead art. 5328 4mm sunflower, one bead art. 5328 4mm hyacinth, one bead art. 5328 4mm white alabaster, and fourty beads art. 5328 4mm jet. Using crimp bead and one half of toggle clasp crimp closed. Repeat for other side.